Composed of at least 59% biobased material including cover made with 25% plant based renewable plastic. Non-stick material will not transfer ink or lift copy from materials. 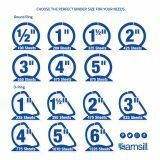 Samsill Earth's Choice Biobased Round Ring Reference Binder, 5" Capacity, 11 x 8 1/2 - Ring binders are must have organization tool for schools, offices, and homes. There are many binders available in market which serve the purpose; however, if you are on the lookout for a sustainable product, the durable biobased reference binder with spine mounted label holder is the right choice for you. 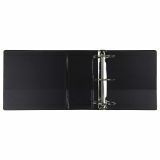 These plant based/biobased binders feature a clear label holder with thumb notch and insert card to make binder organization a breeze for the perfect counter organizer. 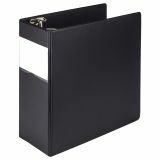 Order multiple binders to create a custom desk reference system for weekly or monthly office reports, multiple classes at school, or other unique personal or professional projects. The biobased reference binders are not only durable and well-constructed but have both biobased and recycled properties that make them a great sustainability solution. 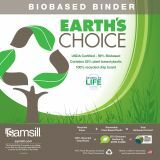 These USDA certified binders are made with at least 59% biobased material and come with a cover made of 25% plant based renewable plastic. 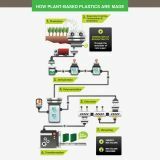 Biobased content is carefully tested using ASTM D-6866 standards. Binders are durable and can be used for storing documents and loose items with considerable ease. 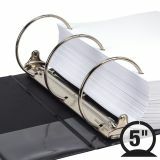 Rings are mounted on the back lid which allows pages to lay flat and prevent wear and tear of the documents. Such a construction also adds to a sleek, clean appearance with no-rivet spine. The rings are sturdy to withstand years of use and easy to open and close. Spine mounted label holder for fast reference and organization.